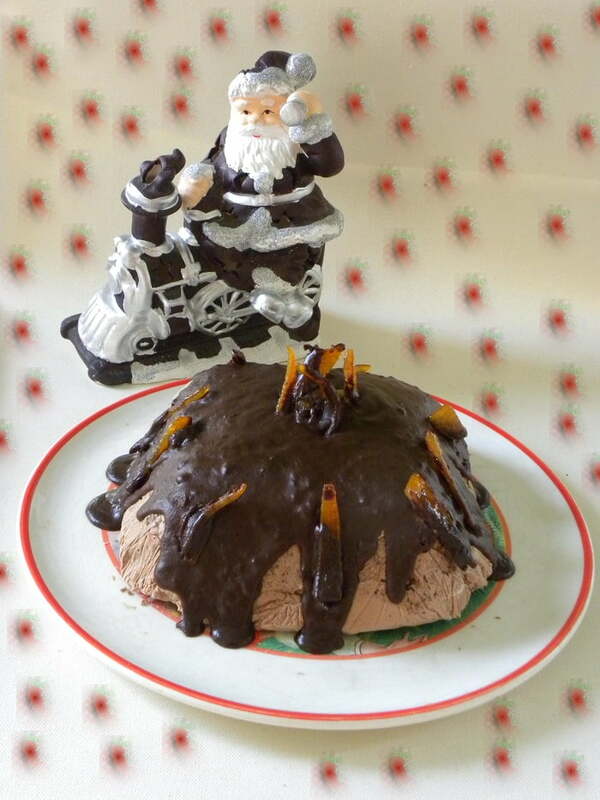 This Black Lava Orange Gateau, is easy to make and was made out of leftover Christmas Cookies. Everyboday gets fed up of eating the same cookies for many days, so I decided to use my leftovers and make a new dessert which we enjoyed after the holidays! Remember in my post for Uses of leftovers – Part I: Cookies, I mentioned a dessert I had prepared a few days before Christmas and stored it in the deep freezer? Today it’s time for revelation. I made this dessert on the day I was making the Whoopie Pies. The problem when making a dessert without following a recipe is that you cannot estimate exactly how much you will be needing, so I had some cream cheese leftover and some of each colour of whipped cream. I had the bits and pieces from the gingerbread house, I had some leftover meringues from some Mont Blancs I had made early November (they preserve well in air tight containers), I used a couple of biscuits from the whoopie pies and to add up to the amount and fill the bowl I was using I added two melomakarona and a kourabies. I roasted some almonds and since I had made the caramelized orange peels that day, I used some of those as well. In this recipe there will be no exact measurements as at the time of making it I didn’t even dream that I would post it. I cut the cookies all in small pieces and mixed in the cream cheese and the whipped cream. I lined the dish with two large pieces of cling film and layered the pink whipped cream first. At the time I was not planning to cover it with chocolate so my idea at the moment was when unmolding the dessert the pink part would be on top. Today when I unmolded it I remembered the chocolate caramelized orange peels, which are still occupying part of my refrigerator, so to make good use of them, the idea of covering it with chocolate sounded good as orange and chocolate are a perfect match!! By the time I took the pictures a couple of hours later, I had finished the Four Citrus Marmalade I started making yesterday, so we tried a small piece of the dessert with the marmalade and it was heaven!!! It is soooooooo goooooood that we couldn’t stop saying mmmmmmmmmmmmm, wow, want more, delicious, ah!!! This is how “Black Lava Orange Gateau” was born. It is the first time I am naming one of my desserts and I think this is a perfect name for it. Leftover cookies: about 3 – 4 cups: I used gingerbread cookies, whoopie pies cookies, melomakarona, kourabiedes and meringues. Line a bowl with cling film, crosswise so as to cover all four sides. Add a layer of the pink whipped cream first (optional). In a bowl break the biscuits or cookies and mix in the nuts, orange peels and creams. Mix well and place in the lined bowl. Cover with the cling film and deep freeze. At this stage it can remain as long as you wish. Unfold the cling film and invert in a platter. Remove the cling film. In a double boiler prepare the ganache. Put the chocolate and mix to melt, add butter, liqueur and orange zest. You will see that it will soon become thick again. Start adding milk (or cream) and keep mixing until it becomes creamy again. Pour it in the centre and leave it fall without spreading it with a spatula. Decorate with the Chocolate orange peels. Place in the refrigerator for the ganache to set but also for the frozen cream to become soft again. During summer keep it in the freezer. I crumbled 10 kourabiedes 2 melomakarona and 6 – 7 gingerbread cookies, added a heaped tbsp mandarin marmalade and mixed them. I did not add any nuts or dried fruit in the dessert as my kourabiedes were filled with a date and roasted almonds and the melomakarona were again stuffed with dates, walnuts and mandarin marmalade. All these cookies were mixed with the marmalade and were bound together with a Chocolate ganache. I lined a bowl with cling film, added the cookies and refrigerated it for 1 hour. I was planning to add more chocolate ganache on top but when I unmolded it, I saw that it was not necessary. For decoration I added some mini marshmallows and red truffle and refrigerated it again. No freezer is needed for this dessert unless you want to eat it much later. This is my last post for 2010. A brand new year will be here in a few days. The one that has passed has been good and bad. It has been good because my husband and children are all well and in good health. I am really very happy that all three of my children are at University, the two of them doing post graduate studies and Elia, who is the youngest is a freshman (is there another word for a girl?). I have seen my book published and this is a dream come true. However, life has lots of sorrows as well and loosing my brother was an ordeal for the whole family. A new year is coming filled with dreams, hope, expectations, resolutions, fears and forecasts. Who knows what is in store for us? Only God. My sincerest wish is that everyone will be healthy and if we are healthy we can achieve anything we want. Happy New Year dear friends and readers of my blog. Happy New Year and Xronia Polla Ivy!!! I think that 2011 will be your year! A wonderful dessert! I love the way you used leftover cookies. I love looking at your site. I'm Albanian so the food is very similar. I'll have to try this one. Nice to meet you Alayna. Shall be looking forward to seeing your recipes. Happy New Year, dear Ivy. I really like your creativity. Your gateau looks wonderful. Un gâteau des plus réussis et une manière magnifique d'utiliser des restes. J'aurai bien aimé en goûter une tranche. Tous mes vœux pour cette nouvelle année. Qu'elle soit pleine de bonheur et de gourmandises. Judging by the ingredients, that ganache, the orange jam, I would be swooning too! I really think that having excellent components is key here. I would love to find out more about this marmalade you have made, or is the recipe in your book? can't wait to find out! Happy holidays dear Ivy. Hope that the book and your children bring you a lot of satisfaction in 2011. Thank you Joumana. Although I have made this marmalade in the past, I never posted it. I shall do my best to post it soon. Wishing u a happy and prosperous new year to u and ur family..Marvellous gateau..
Ivy your dessert is very imaginative. Great idea for left overs! I wish you a Happy New Year and all the best to you and your family! Καλή χρονιά με υγεία να έχεις και ό,τι επιθυμείς! I'd like some black lava poured right into my mouth! What a delicious and resourceful dessert. Ivy mou Happy New Year for you and your family. Healthy, Prosperous and Sweet with big success with your book. What a creation! Such a clever way to use leftovers. This is a spectacular dessert Ivy – and choc orange is a killer flavour combination.